As mentioned earlier, I’m at the APS March Meeting in Boston this week. 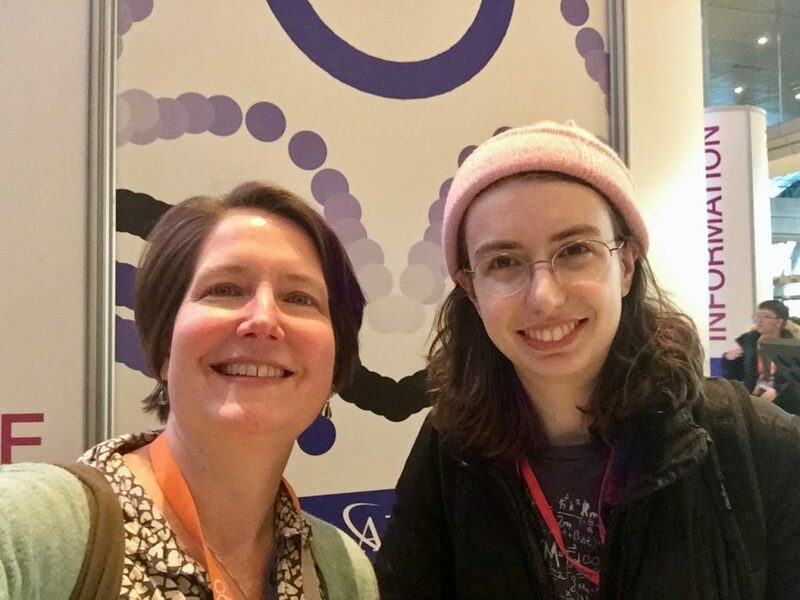 There’s so much to say about all the talks that I’ve been to, etc, but in this post I’m just going to tell you about all the amazing Wooster connections! First off, of course, we have five students here this year from the REU program last summer, and Dr. Leary and I are both here. 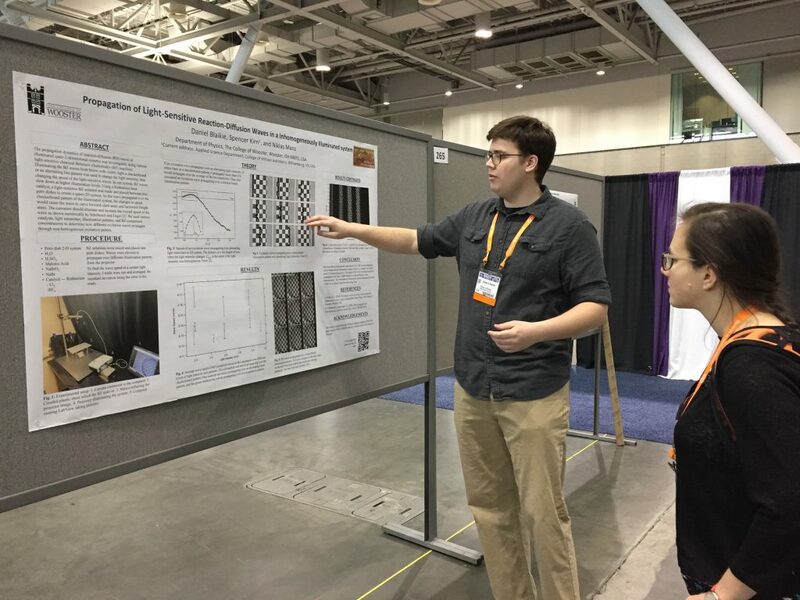 It’s fun to bring students to the meeting so that they can see how huge and diverse the larger world of physics is. One of the great things that usually happens at the Meeting is that Wooster alumni come by to see our student posters. Tuesday morning I went to see Andrew Blaikie ’13 give a cool talk about graphene trampolines to be used as broadband bolometers. Andrew is just about finished with his Ph.D. at Oregon. He did a nice job with his talk, since he’s an old hand at the March Meeting by now. Devoted readers of the blog will remember that we featured Andrew last year in the blog posts about the March Meeting in LA. 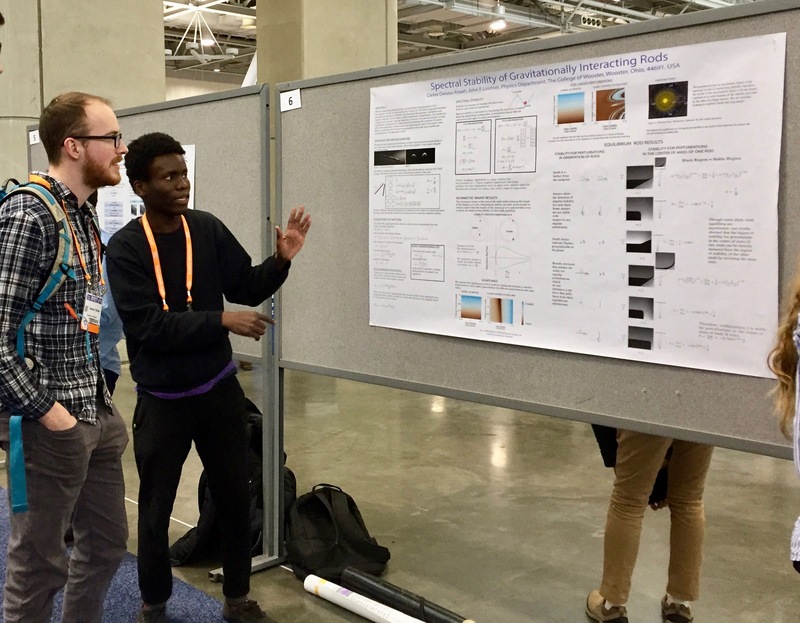 Andrew did the slash-slash project with Dr. Lindner for his Senior IS, so he came by the posters today to quiz Carlos Owusu-Ansah about his results with the latest incarnation of that research. Melinda listens to Daniel explain light sensitive BZ waves. Walking around, I also bumped into Melinda Varga, who was at Wooster last year doing a post-doc with Erzsébet Regan that blends physics and biology. She is still doing the postdoc but now is physically based at Harvard Medical Center. She came to the poster session to ask our students about their work! I then also coincidentally sat down right next to Hannah Peltz Smalley! Hannah was a Wellesley student who did the Wooster REU in 2017, and she is now a grad student at RPI. Walking down the hallway to a session, I saw Nick Harmon ’04! We chatted for a while to catch up. He and his family recently moved to Indiana, where he started a position at the University of Evansville. Amy Lytle investigates beautiful knit work at Elisabetta Matsumoto’s talk. 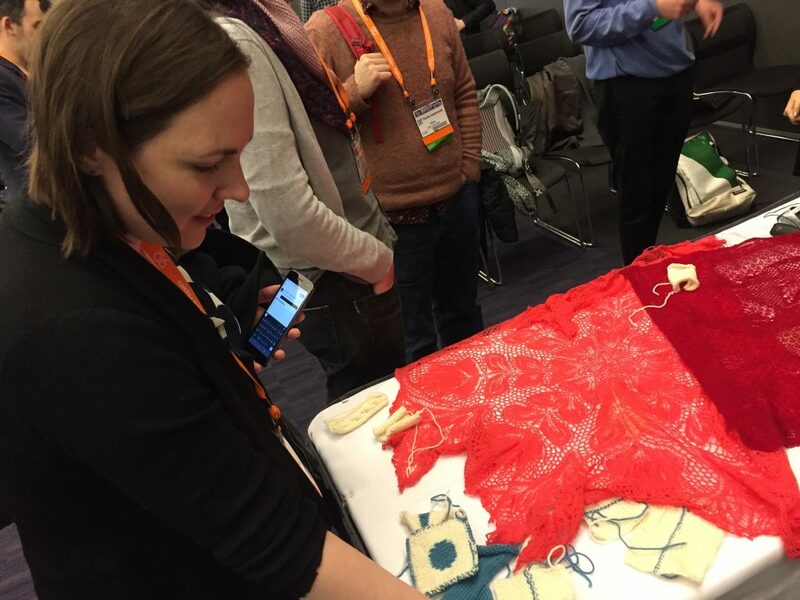 On Wednesday morning, there was session on Fabrics, Knits, and Knots that started with an invited talk by Elisabetta Matsumoto. Many of you know that I am a knitter, so this was a cool “worlds collide” moment for me. Afterward, I was up at the front looking at the demonstration pieces that Elisabetta had brought, and Amy Lytle ’01 tapped my elbow to say hi! She graduated before I came to Wooster, but we’ve met many times by now. 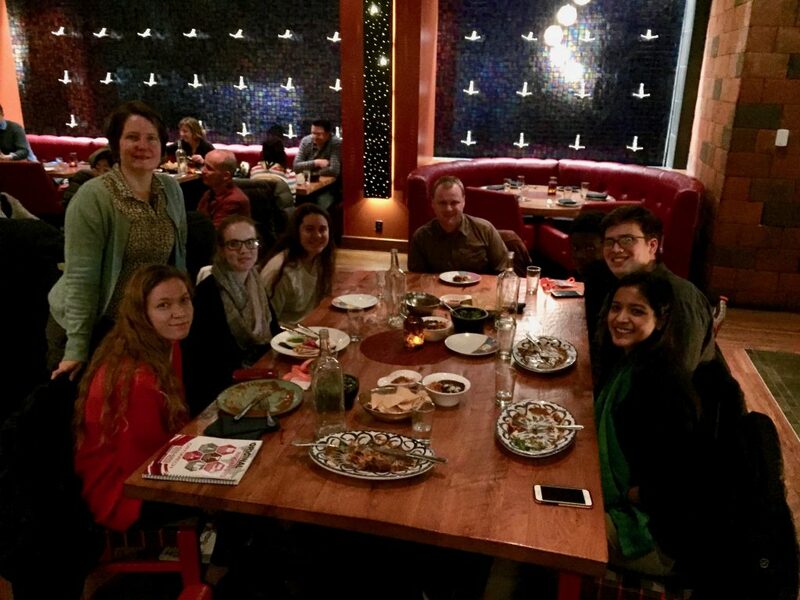 Wednesday night, we had our group dinner, along with Popi Palchoudhuri ’16. She works here in Boston at E Ink, the maker of the ePaper technology that is in Amazon’s Kindle devices. Popi is famous in beadpile history, both because she did the beadpile project as a first year summer student and again for IS, and also because of the quality of her lab notebook skills! Finally, I was walking around the exhibit hall one last time this afternoon. I passed by the Institute of Physics booth, not planning to stop originally, but paused to ask a question about one of their display items. The person I was talking to looked at my badge and said “College of Wooster! !” It turns out that she was Maggie Donnelly ’11, a history major! She was heavily involved in journalism at the College, took an editing job at an astrophysics journal once she left Wooster, and now loves being involved with academic publishing! 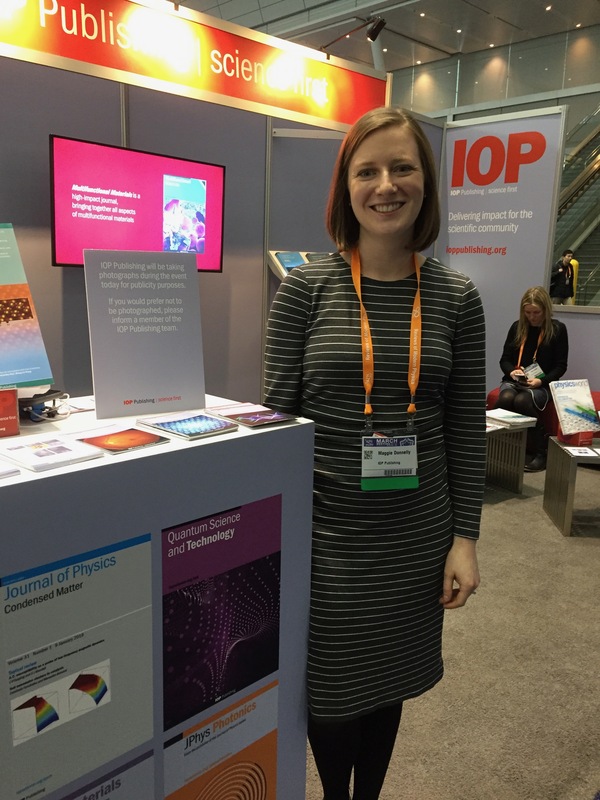 One of her projects is the new Quantum Science and Technology journal by IOP, which you can see featured in the poster right beside her. We talked for a while about the excellence of Wooster and what a wonderful community it is. It was great to meet her. This entry was posted in Students, Travel, Wooster. Bookmark the permalink.